We hope each and every one of you enjoyed a pleasant holiday season surrounded by your loved ones. Cai and the team recently came back from Buenos Aires, where his exhibition Impromptu opened to the public at Fundación Proa and will remain on view until March 1, 2015. The exhibition includes new series of gunpowder drawings on paper and gunpowder paintings on canvas, as well as two new art installations. In conjunction with the exhibition, Cai will also create a new large-scale explosion event Life is a Milonga: Tango Fireworks for Argentina that will take place in front of Fundación Proa at Vuelta de Rocha on January 24, 2015. 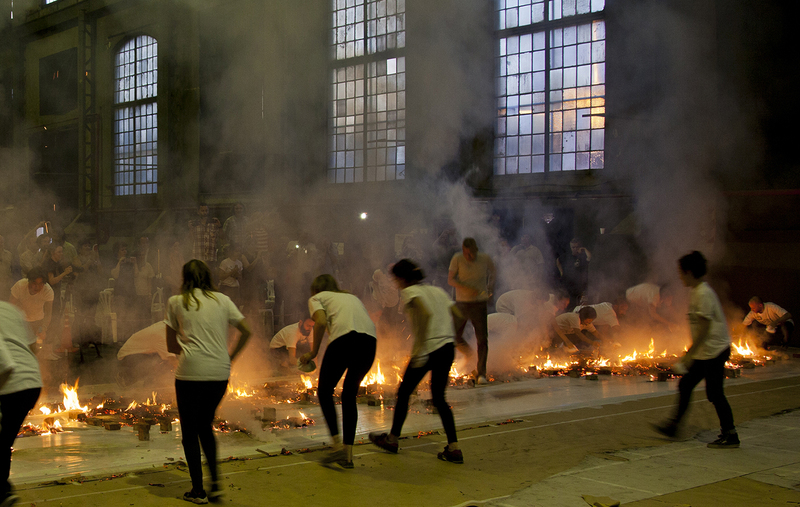 Cai Guo-Qiang and volunteers rushing in to put out flames from ignition of gunpowder drawing Sentinels of the Enchanted Valley, Galpón de la Boca, Buenos Aires, 2014. Photo by Wen-You Cai, courtesy Cai Studio. “For this exhibition, I set a small but ambitious goal: How can I push myself and improve my gunpowder drawings? In recent years, I have worked in different places around the world, initiating dialogues with different cultures and people through collaboration. By absorbing nutrients from the land I work in, I have perfected a methodology, which has allowed me to create a body of work that revolves around different themes with relative ease and familiarity. My exploratory journey in Argentina has not been smooth. The more I learn about the country, the more confused I become. Her culture, the integration of immigrants with this piece of land have made me feel lost and perplexed. As my work here materialized in a more spontaneous and organic manner, the exhibition is titled Impromptu. Sure enough, the gunpowder here is difficult to handle: if I use too little, it does not catch on fire; however, if I use too much, it ignites with ruthless ferocity. At times, the bricks and cardboard that covered the drawing sizzled when they were cast aside after the explosion! Flames erupted time after time as I watched, and the drawings were set ablaze. The outcome was far from what I imagined; after this experience, I cannot help but admit that I do not have great control. Yet secretly I felt both a youthful impetuousness and an irrepressible excitement. It must have been twenty years since I last experienced this pain and pleasure simultaneously! I started to question myself –– why am I afraid of burning holes through the drawing? Don’t the burnt parts add to the presence of the medium itself? I saw more… and it may have opened another door to freedom. The first work that visitors encounter in the exhibition is Life is a Milonga, an installation comprising of nine ceramic figurines of couples swaying in the air, dancing the tango to the recognizable rhythm of “La Cumparsita” playing melancholically from music boxes. From the ceiling, nine bar stools hang upside-down, supporting the swings that carry the figurines. “After visiting several milongas, I observed several different types of behaviors: there were people sitting on the sides waiting to join the dance; people walking over to join the dance; and a mélange with people, lights and music of all sorts—dancers grouped in diverse combinations, swaying and moving in tandem. Through this installation work, I hope to express my uncertain yet boundless impressions of the milonga, and the lives of the people in it. 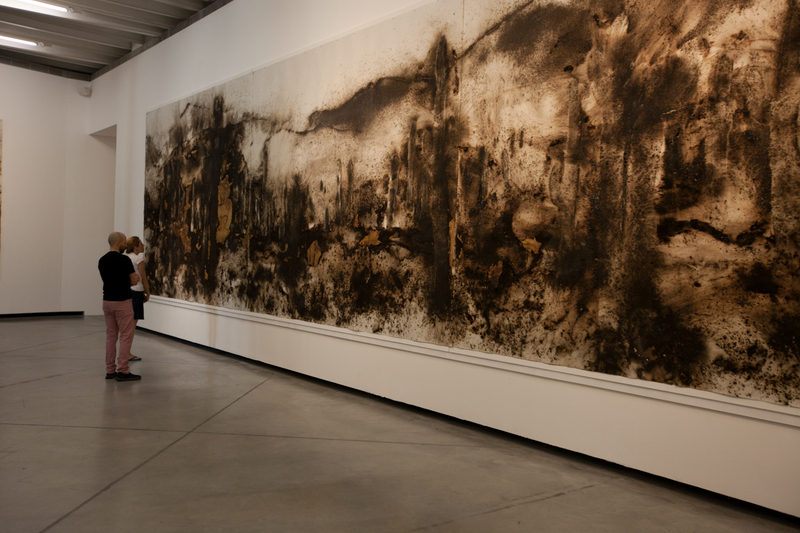 A new series of gunpowder drawings inspired by Argentinian landscapes is presented in Gallery 2. The works reflect Cai’s impressions during his visits to the Misiones and Salta regions in the north of Argentina. Exhibition view at Fundación Proa. Photo by Wen-You Cai, courtesy Cai Studio. Sentinels of the Enchanted Valley, gunpowder on paper, 300 x 1600 cm. 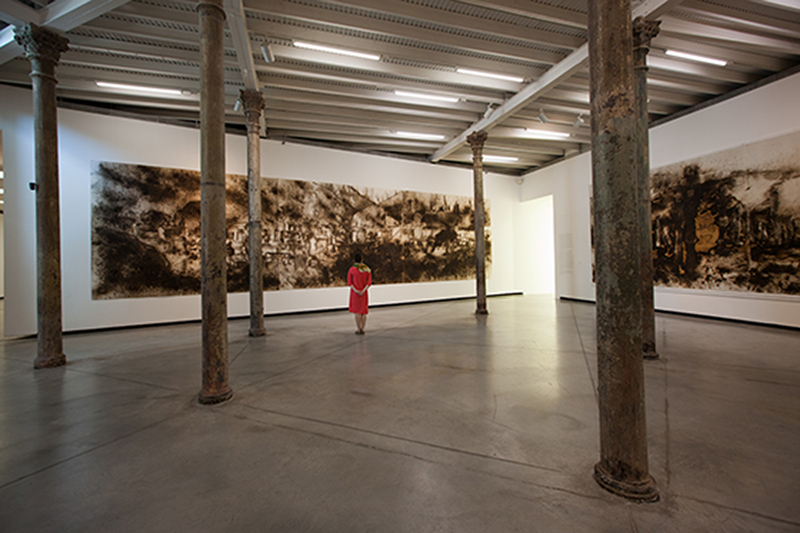 Exhibition view at Fundación Proa. Photo by Wen-You Cai, courtesy Cai Studio. 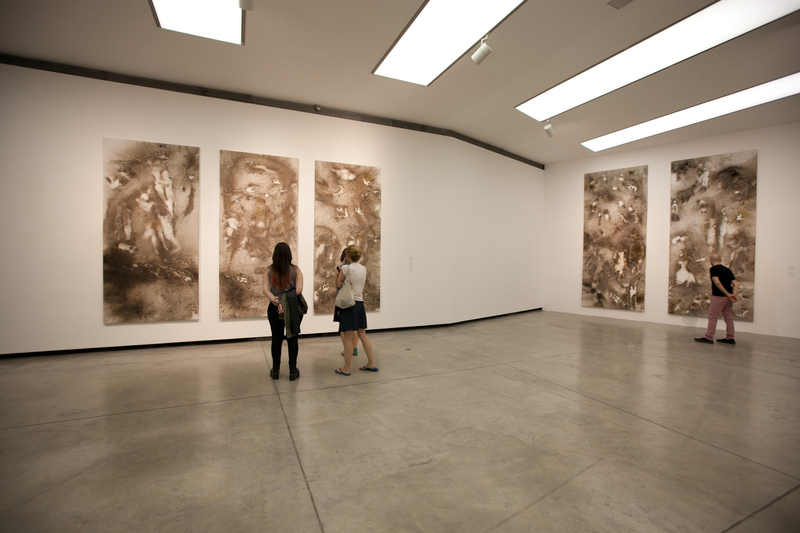 “The colossal sizes of the drawings turn them into spatial works, allowing viewers to enter the scene of the drawing. The content of each drawing and the relationship between them reflect the experiences I had when exploring the landscapes of Argentina, feeling the country’s land with my body and taking a stroll in its geographical and cultural landscapes. When making the drawings, I used my body to experience the landscapes again: the mountain ranges of Cachi, where fog constantly comes and goes, and the spiky cacti that absorb moisture from the fog; the boundless Iguazú Falls that have no beginning and no end; and the cemetery where the eternal “residents” slumber in harmony on the distant plateau of Cachi. There I met a family and helped them repaint their parents’ graves with a few strokes of new paint. The latest iteration of Cai’s ongoing exploration of painting traditions, a new series of six gunpowder paintings on canvas, titled Impromptu, is presented in gallery 3. Impromptu, gunpowder on canvas, variable dimensions. Exhibition view at Fundación Proa. Photo by Wen-You Cai, courtesy Cai Studio. “These six works on canvas are a mystery and an unknown that I left for myself. When I work on an exhibition, I usually leave one gallery with an uncertain outcome, so I can surprise myself and create some anxiety for myself when encountering this unknown. I intentionally made the canvases tall and narrow, so the proportions are similar to altarpieces, alluding to Southern European Medieval and Renaissance painting. I referenced the atmosphere in paintings by El Greco—one of my favorite painters—and added tango dancers dancing at different speeds; I also selected images of nearly 100 small wooden animal carvings that I fell deeply in love with at Iguazú. The Guaraní people use burn marks on the wooden animal carvings, which inspired me to use gunpowder to create their images. Multiple timelines and diverse cultural characteristics appear in these vertical compositions. Although these disparate elements form a certain disharmony, they capture precisely my perception of and bewilderment toward Argentina. Because of this, I am most moved by the spirit and temperament of these works, brought about by these independent and chaotic energies. COMING SOON. SAVE THE DATE! Proposal for Life is a Milonga: Tango Fireworks for Argentina, 2014. Courtesy Cai Studio. “My first visit to Buenos Aires took place in March of 2014. The history of Buenos Aires as a port deeply inspired me, and I was especially touched by the immigrant legacy of the neighborhood of La Boca and its rich cultural traditions. The idea of creating a tribute to Argentinean history and tango immediately emerged. La Boca’s creative past still reverberates at each street and corner. It is my hope to use this opportunity to invite the public of Buenos Aires to tap once again into this rich vein; hence my proposal combines the power of history, dance and contemporary visual art. Using my signature aesthetic language, the artwork will use fireworks as a medium and will actively engage the public as participants. For Tango Fireworks, I am using a brand new approach to pyrotechnic design. During the creative process, I invited experts such as musicologists, choreographers and dancers to collaborate with me. I used video to record the dancers’ movements and the movement of the bandoneón from many different angles, so that I could use the dancers’ steps and body movements to design the fireworks. 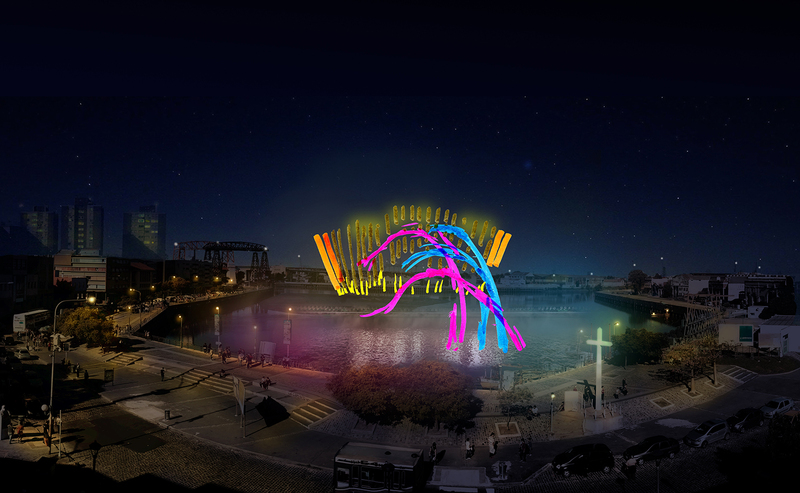 The fireworks will appear over the water of Vuelta de Rocha, imitating the dancers’ and the bandoneón’s motions. On January 24, 2015, the public will be invited to watch and dance along to Tango Fireworks in front of Fundación PROA, transforming Vuelta de Rocha once again into a pulsating hub of creative energy.